You don't need to have a twitter account to consume public twitter posts. Even if you don't consider yourself a social media person (and you don't want to sign-up for your own twitter account) you can still read posts by others by going to twitter and reading AAS-related posts and hashtags. One of the best aspects of Twitter is its ability to connect people who may not otherwise interact. You can use the conference hashtag to find out about meetups or other events you might want to attend. If someone gives a fascinating talk about an alternate career you’d like to pursue, you can reach out via Twitter to invite them to coffee. If someone’s spot on commentary catches your eye, you can follow them to stay connected once the meeting is over. Sometimes engaging with other people on Twitter can lead to future projects or even scientific collaboration. Twitter can provide the means for mutually beneficial relationships just like traditional networking, with the added benefit of continued digital interaction. I will be speaking on the 'Beyond the Academy' #career #panel at #AAS229. Friday, 1/6 at 2pm. Learn about how to become a #datascientist. Please note that if you start a tweet with an @-mention only the person you @-mention and their followers will see the tweet, so it's common-practice to put a dot or a space before the @-mention if you want the tweet to be published to all your followers (H/T @astronomeara for the tip). Because of the sheer volume of content at the AAS winter meeting, it’s impossible to attend every presentation. That’s why tweeting about sessions in real time (live tweeting) is so important: it allows attendees to catch the highlights of the talks they missed, and folks at home can take part in the conference from afar. Live tweeting is a service to the community that makes the AAS conference more accessible. One downside to live tweeting is that you can miss some of the presentation as you’re typing. Using a laptop or a tablet with a keyboard attachment can help with efficiency and also conserves precious phone battery life. It’s important that all tweets in one group (say, from one specific talk) can be read as a single thread. This will make it easy for anyone to get your commentary for that talk in one place. To build a thread, post your first tweet as you normally would. Reply to that tweet, erase your username (it automatically appears) and write your next comment. Continue replying to each subsequent tweet - not the original one - and Twitter will configure all the tweets as a thread. Now, when someone clicks on any tweet in that thread, they will see the other tweets displayed on the screen as well. You can also thread tweets by using one of the tweet-storm tool listed below. 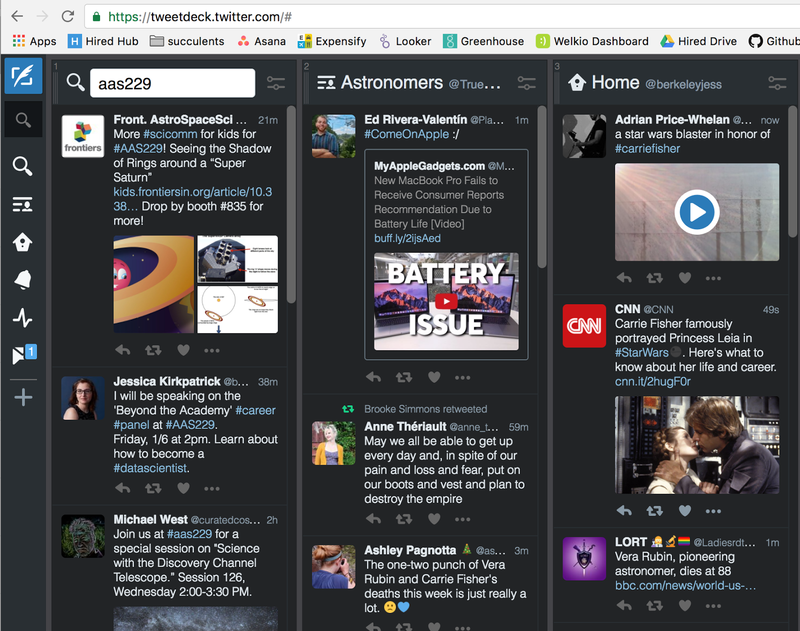 Many people find it useful to use tools like TweetDeck to organize their twitter feeds so that they can group tweets by topic/hashtag. There are also tools like Storm it and Tall Tweets which will automatically turn a paragraph of text into threaded tweets or image tweets if 140 characters is not enough to get your point across. Here a list of tweet-storm tools. After you have gone back to work and the conference dust has settled, you may want to create a Storify of your favorite AAS highlights. Storify is a website that allows you to piece together all your tweets (and any other public tweets) into a story that anyone can enjoy. It’s easy to do, but time consuming if you’d like to include content that others posted throughout the conference as well as your own. Storifying is also considered a service to the community, since folks who were not able to attend the meeting can read the main points in a single place. It’s best to complete your Storify within a few days to a week after the conference is over, while it is still fresh on everyone’s minds. In the digital age, social media can be a powerful professional tool, and astronomy is no exception. We hope this quick guide will make the AAS conference a little easier, more enjoyable, and more fruitful. See you at the meeting, and happy tweeting! If you have further suggestions for how to make the most of AAS+Twitter, please contact Nicole or Jessica and we will add them to this post.